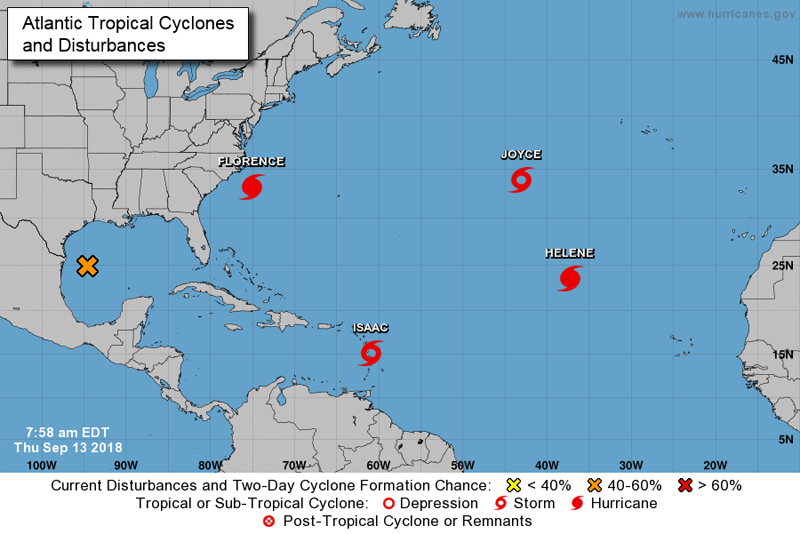 With the formation of Subtropical Storm Joyce – the 10th named storm of the 2018 Atlantic Hurricane Season — there are now four named storms in Atlantic, with Joyce joining Hurricane Florence, Hurricane Helene, and Tropical Storm Isaac. Dr. Phil Klotzbach, a research scientist in the Department of Atmospheric Science at Colorado State University, notes that this is the first time in ten years that the Atlantic has four named storms simultaneously. “The most recent time the Atlantic had four named storms simultaneously was in 2008 on September 2nd: Gustav, Hanna, Ike and Josephine,” Dr. Klotzbach said. According to the Bermuda Weather Service, none of the four storms are a threat to Bermuda at this time.